Ultra Street Fighter II might be considered a lazy (if fun) piece of Switch software, but it would seem that the all-important Street Fighter brand is more powerful than you might assume. According to the latest retail sales figures in the UK, the Switch title had a stronger debut than the recent Marvel Vs. Capcom: Infinite. The new brawler - which launched on PlayStation 4, Xbox One and PC last week - entered the UK physical retail chart in a disappointing 12th position. In the PlayStation 4 single-format chart it limped in at 16, while on the Xbox One chart it didn't even make the top 40. For a top-tier Capcom fighter which has benefitted from months of hype, it's a disastrous showing - made all the more embarrassing by the fact that Ultra Street Fighter II enjoyed a stronger debut week on a single system, and it was little more than a warmed-up serving of Super Street Fighter II HD Remix, a title which is almost a decade old. What Capcom itself will make of these figures is anyone's guess, but the fact that a game which has apparently taken very little effort to create can commercially out-perform one of the company's biggest AAA multi-format offerings for the year - and in one of the territories where Nintendo is traditionally weakest, the UK - then it will certainly give the publisher pause for thought. Well, if you spit X-Men fans in the face, I'm not surprised if they don't buy the game. The game just looks so ugly... That and I don't find it fun to watch. You slip up once and you get combo'd for 5 minutes. @In_Ex_Fan And you can blame Marvel for that. Guess people still haven't forgive Capcom for the lack of content in SFV. Ugly art style, no X-Men, games has little content, no wonder it doesn't do well. I think this is a Bad Karma for Capcom after abandonded Nintendo fans. Capcom today is not the same as Old Capcom before. Well, MvCI doesn't look at all appealing, while USF2 is at least Street Fighter II, a game anyone could acknowledge as a good title on its own. @Anti-Matter Don't worry, they'll get their money back from SFV/MvC:I tournaments. @MarcelRguez I know. But the excuses of the devs are what's insulting. I bet if MvC had released on Switch along with the others it would have fared far better, possibly being the best selling version just like many multi-plat indies are. I would certainly have bought it. Good, a MvC without the X-Men or Doc Doom ain't a MvC. The playable appearances of Thanos, Venom and Ultron made me a tad interested but I stand with my choice of boycotting this game. Stupid Marvel/Disney with their agenda against Fox. When a blatant rehash of an Xbox Live game has more love put into it and gives you more bang for your buck, you've screwed up. The XB1 version didn't even make it on the charts. I wonder if Capcom will think twice on supporting the XB1 like they been doing with the Switch? Ultra is a great rendition of my beloved Super Turbo. And the HD side received many updates to make it feel more than a rush job. Infinity may be competent enough, but it feels more like "Marvel: The Movie: The Game" than a Capcom product. I was turned off since the trailer. Then I read about the poor production values of the Collector's Edition. Then I saw the DLC roster. For me, it's a big pile of "meh". I'll catch it in a complete edition at sub-$30 in two years. Capcom keeps messing up when they keep bending to external forces, i.e. SFV and Sony. I wonder if something similar will happen with Monster Hunter. Say for example Monster Hunter Generations having a better debut than Monster Hunter World. @Grumblevolcano I highly doubt that, World actually has a ton of effort put into it whereas this, doesn't. I pointed out before that people were very unhappy with how Marvel v Capcom Infinite looked, especially some of the characters. No X-Men. Releasing it without them was stupid. I thought USFII was too pricey at $40... but I bought it anyway, because it makes great use of the Switch's portable multiplayer gimmick. And on the other side... Removing the X-Men, who've been a MAJOR part of this roster over the years, is a deal breaker for me. I have zero interest in buying the game now. Scarlet Witch needs to slow her roll with this whole "No More Mutants" thing. It's rippling across the multiverse, and spilling into the Marvel executives of our world. I'd like to think that the reveal of Dragonball Fighter Z from E3 also had an effect on this game. Well no doubt about that, when you're trying to screw over the X-Men fanbase, you won't see the support. I betcha they'll make the X-Men into DLC characters later on to cash-in on the X-Men fans. @In_Ex_Fan What would you have them do? They can't exactly badmouth Marvel. @MsJubilee Apart from Dead Rising and Resident Evil Capcom's franchises seem to show no appeal to Xbox owners. I wouldn't be surprised if MHXX on Switch outsells the Xbox version of MHW. They should wake up. Fans of Japanese games have moved away from Xbox. They are either on Sony or handhelds. Why they keep putting multiplats like Okami and Disney Collection on there I can't hazard a guess. It isn't the 360 utopia anymore. @QwertyQwerty But what's the point if that version bombs hard?Capcom is one weird company. They support the Switch like garbage (A console that already had one successful Capcom title),but they support the XB1 knowing damn well games don't sell for crap. Take a hint Capcom.....START SUPPORTING SWITCH!!!! @MarcelRguez still doesn't mean that they should blame the players. Things along the lines of "people don't really remember the X-Men." and "They care about the moves, not the characters." are just terrible and most importantly false excuses. It's too bad they can't use almost any of the X-Men (does this have Scarlet Witch and Quick Silver like in MCU movies? ), Doctor Doom and other such great characters. Well, I guess they can but it would be free promotion for characters they don't have movie rights to anymore. i am putting this down to the fact that there's no wolverine. marvel's been cutting off the mutants at the toy level, and now the games. no promotion for movies that someone else produces. Now what would be an alternative reality like, where Marvel didn't have money problems. Would we have an MCU with EVERY CHARACTER? I think people are starting to get smart which games release full price with threadbare features and how they can get more content and a price cut if they wait 3-6 months. When your game looks worse than the previous game, you're in trouble. @In_Ex_Fan That I can agree with. Pants roster, no switch version, uninspired and unfinished graphics and presentation, no switch version....Can I just play MVC3 please? @Grumblevolcano Here's hoping. I have no idea why they spent all that time building a fan base in the Nintendo market in that series just to do this. Of course it did, Street Fighter is THE fighting game. Wait a month or so and then compare numbers. Capcom needs to take a long hard look at what Namco is doing and why it works because ever since SFV they clearly have lost their touch. Hope they get their mojo back ASAP, I want some Capcom fighting love on Switch. Usually games do good for both physical and digital. Seeing it didnt do great on the physical release side, i wonder how the digital side went? I personally love the series. I enjoy the art style and the controls. However, we chose to skip it on the PS4 because I can't justify the value. As a full price retail game, it's lacking content. It seems to me like it would be fairly priced at $29.99. Now, I do think that this game would have gotten a boost if it were released on the Switch. Capcom's loss. Hopefully they learn from this....they probably won't. And announcing DLC right in the first trailer of the game is never a good idea, when will crapcom learn? Switch was still only two months on the market when SF II hit, SF II is also one of the legendary games in this industry. However, aside from RE VII, Capcom's most recent newer games have been very, very disappointing and SF V in particular was an incomplete mess at launch. People remember that and then there's the fact that games seem to drop in price quickly these days and Capcom's obsession with 'Ultimate Editions' later down the road. The demo also was a bit disappointing. Seemed good but not great. If you people want a great fighting game, Injustice 2 is already on the market. This is true too. While I think for a game like MvC - which obviously should have more appeal in the West than anywhere else - Xbox should be a target platform, it's entirely stupid that these Japanese companies continue to leave Nintendo platforms out of the equation while putting their stuff on a brand that the Japanese market has rejected entirely since 2001! Story mode is just so bad, the Arcade mode is pure fun. I'm sure a lot of people will think "Surely this should be a strong case to finish up their evaluation of the Switch" and start supporting them for real already. The explanation will change from "Street Fighter is a strong brand" to "Ultra was just an anomaly because it was a launch title for a brand new system" and they will hold Nintendo fans accountable for this failure somehow because that's the reality now. Marcel vs Capcom Infinite is an incredible game. They should bring it to Switch. It'll do better than Street Fighter did, I'm sure of it. Clearly, this means Capcom should abandon the rival consoles and develop for Switch exclusively. @Dang69 I know, since I'm a huge movie fan. But as I said in another post here before the developers excuses for that bother me way more. I actually love the X-Men movie franchise. Now we play the waiting game. Capcom, don't do a Super Ultra MvC:I revision unless you plan to include Switch. And more Characters. Or.....add Nintendo characters for a MvN. Something something Smash Bros, I get it. MvC Infinite looks to be one of the biggest sales disasters from Capcom. They want the game to sell 2 million copies by March 2018; instead, it will struggle to surpass 500,000 copies sold by then. A lot of people complaining about the DLC before launch... will you be complaining too for FE: Warriors DLC announced too? Maybe people are waiting for the Ultimate Edition when they actually include a single player mode. Street Fighter V all over again. The big factor people are failing to realize is that when USF2 released on Switch, there wasn't much else to choose from. People (like me) were hungry for a good fighting game to take on the go. I think we're still at a point where releases are sparse enough on the Switch that if MvC Infinite could still find quite an audience here. 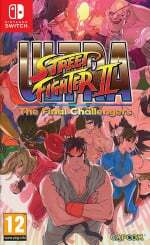 Ultra Street Fighter II: The Final Challengers was a dream game come true for me. Don't care what anyone else thinks. I miss the 2D artstyle in Capcom games of old. They didn't even perfect it before 'updating' franchise graphics. They didn't need to transition to 3D. Sadly, Newer entries in MvC and Street Fighter are dead to me. Skullgirls is a way better MvC:I . Its 2D, has good animation, top quality gameplay that is easy to understand and hard to master, and has heart put into it. When I see Crapcom's recent fighting games I see nothing but cash grab and a soulless corporation trying to ditto what Capcom used to be. Can't say its not deserved! Karma bit you on the behind, Crapcom . Serves you right for all the jerk moves you have made recently, particularly involving the Switch. Have at you Crapcom! @Sihy There's a difference between having enough (or more then enough) content that the dlc feels like a bonus and lacking/missing content just so dlc can exist. This feels like the latter. Not surprised. The visuals/presentation are terrible, the roster is horrible, the demo was bad, and the PR was a disaster. The game didn't exactly have great marketing either - they banked on the MCU's popularity, yet didn't even tap in to that brand's selling power. Oh, and Dragon Ball FighterZ completely stole the game's thunder with it's vastly superior presentation and attention to detail. @Peach64 Ok people like you is why there are a lot of misinformation about this game. There is a story mode AND an classic arcade mode, also the usual mission, local VS and online. Looks like this game will be like a platform from now on, something like KI on Xbox, just adding more characters to the main game and not releasing another version. Is fine that people complain about X-Men or FF, but lack of single mode? That's not true. @Captain_Toad DLC is DLC. No matter if you think is a paywall or actually expands the game, if you announce DLC BEFORE the game launch, that's bad, regardless if is Nintendo or Capcom. @MsJubilee They're stuck always chasing that "CoD money"....the mythical big western market that will buy video games by the millions while Nintendo can only push hundreds of thousands. They almost bankrupted themselves with that thinking before, and seemed to learn their lesson. Then got rid of everyone who learned the lesson and went back into the trap. Waiting until I can get it for $20 on Steam. until then got the excellent MvC3 for $15 on Steam s bit ago. I will be buying that Dragonball fighter day one though! Well... MvC:I isn't very good is the first issue. It's not as horrible as some folks are saying but it is a step back from 3 (which was a step back from 2 so....) and you can play 3 on modern systems....so yeah only folks looking to play in tourneys are really jumping on this right now. Second USF was based on a very solid version of Super Turbo so its essentially a tank with a tune up...not much needed to be a solid game (loving the tech throws though....even though I had to change up my playstyle...). @In_Ex_Fan I was about to say, no X-Men no sale. X-Men and X-Men fans made that whole franchise. PR disaster...the game doesn't seem bad tbh. Bring it to the Switch. Honestly nothing about this game has looked remotely worth getting to me. It just looks like such a cheap, lazy cash-in. One is SFII, the other is not. I can bring out SF II & everyone knows it and wants to play it...I bring this out and not one of my friends would have a fleeting interest in it. I bought SFII at full price, that this site ridiculed. I wouldn’t buy this game for $5...as it’s not SFII. And the general public agrees. You guys underestimate the draw for SFII, probably because you’re too old or...well, I have no idea why else. This game looks horrible, Marvel vs Capcom 1 & 2 look miles better than Infinite. The 2D sprites fit so much better than 3D characters animation. @MsJubilee Nah the XB1 is a vital for Capcom and they have guaranteed atleast 10 sales for Okami HD in the UK. Whereas the Switch is a bit shaky, nobody knows if there's an audience for a LoZ-like game on a Nintendo system. MvC:I's overall visual presentation is synonymous with phone games. Everything looks awful, which is especially disappointing because the gameplay is apparently fantastic. Still on the fence about this one. The only thing keeping me interested is seeing how they handle Sigma's moveset. Regardless, good news for Nintendo (which, as of late, has fortunately been consistent) and a hopeful opportunity for Capcom to support the Switch. Pokken Tournament DX also out sold Marvel Cinematic Universe vs Capcom: Infinite. it kinda makes sense you can't mess up the SS2 characters just a HD remake. You can chose bad characters and make them look bad. Plus a monster hunter character? That seems perfect for a soul caliber game Still interesting to see though. Honestly, I don't see a reason to get MvC:I for my Xbox One given it has no X-Men, the game is back to 2 on 2, assists are cut from the game, and the roster is much smaller. I already have Marvel vs Capcom 3 Ultimate on the Xbox One, so why would I buy a gimped sequel that is missing content and seems to have fewer features than the previous game in the series? Some, but not all, of the reasons Marvel vs Capcom: Infinite didn't sell well. Disastrous first impression at E3 2017. Ugly art style which attempts to be "cinematic". Ugly character models for many of the iconic characters. They "fixed" Chun-Li because people were complaining about it to them every day but many other characters still look terrible. Terrible demo which further accentuates that the story is corny and cringe inducing, but attempting to play it straight. Lack of opportunity during the demo to really test out game play. Dragon Ball FighterZ, another team based fighter, was announced the same week to further make MvC: I look terrible by comparison since that game looks like there is real passion behind the development. Blazblue Cross Tag Battle announced at EVO 2017 giving people even more team based fighter options besides MvC: I. Nobody except Disney cares about their petty feud with 20th Century Fox for the movie rights to their Marvel characters, they just want the game to have the characters they like. Exclusion of the characters which 20th Century Fox owns the movie rights to doesn't sit will with anyone who cares about those characters or franchises, or even the MvC series for which those character have been a part of for a long time. When asked about missing characters like the X-men a Capcom representative said "characters are just functions (as in the characters themselves don't matter)" and a Disney representative said "do people even know who the X-men are anymore? ", while obvious question dodges because they can't just say the Disney executives won't allow them to be in the game, is nonetheless extremely insulting to everyone's intelligence. Like almost everything else Disney does with Marvel these days outside of the comics themselves, MvC: I looks like just another attempt to advertise for their movies, where "the real money is made". @Oat The gameplay is the only thing I don't think is really wrong. I don't like it but I don't think it's necessarily 'wrong'. Everything else about the game just looks bad. All the gameplay in the world won't help this game if no one wants to look at it. Keep in mind, Capcom just had a 30th Anniversary livestream for Megaman and the big reveal was a $300 Megaman body pillow. That is the Capcom we're dealing with now. More irrational than Nintendo when you think about it. Too bad I haven't been around today, I'd have loved to watch this thread unfold. The related NeoGAF discussion was hilarious, to say the least! Well, obviously it’s because the game doesn’t feature any Justice League characters. Especially a certain Fastest Man Alive? Aside from the MCU, Marvel itself is slowly becoming poison. Street Fighter this, Marvel vs. Capcom that, just give us a new Darkstalkers game already and be done with it! True, i am a big Hulk fan, but didnt like the mvc design. The characters feel kinda cheap. Capcom just need to release MHXX to the west! @Lord na, monster hunter world is how you enter the west market. well it also fell out of the top 20 the following week. SF2 did 450K total. You kind a need to see what this does for capcom before any victory laps.